Stir almond milk, flaxseed, agave, coconut oil, yeast, sea salt, and cardamom in large glass bowl with lid or cover. Add flour, mixing with wooden spoon. Cover with lid or wrap, let stand 2 1/2 hours at room temperature. Transfer to refrigerator, resting overnight. Coat baking sheet with cooking spray, or line with parchment paper. Remove half of dough from refrigerator; reserve remaining dough for second loaf. (Dough will keep in refrigerator up to 5 days.) Divide dough into 3 equal pieces, gently roll each into 18-inch-long rope on floured work surface. Place dough ropes side by side spaced 2 inches apart on prepared baking sheet. Pinch ends together on one side, and tuck under. Loosely braid dough ropes, then pinch tail ends together. 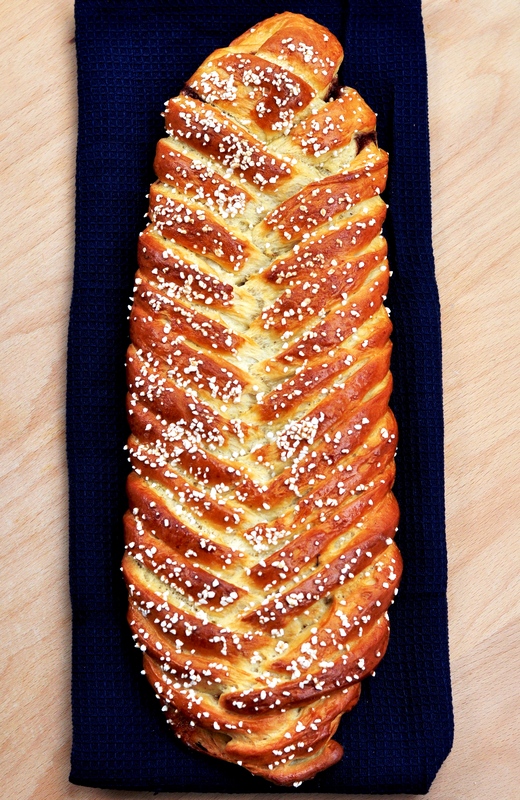 Cover braided loaf loosely with kitchen towel or plastic wrap, and let rest 30 minutes. Next preheat oven to 375°F. Brush top of braided loaf with almond milk, and sprinkle with raw sugar. Bake 30 to 45 minutes, or until golden brown.